Enjoying the beautiful surroundings of Spring Hill Farm in Winfield, more than 380 people attended the 21st annual Great Cowley Duck Dash on Saturday. The event, which featured a duck race and duck squat, has raised more than $320,000 for student scholarships over the past 21 years. Cowley College vice president of institutional advancement, Dr. Kori Gregg, said it was nice to be able to enjoy the beautiful surroundings of Spring Hill Farm. Steve English, CEO of TCK – The Trust Company of Kansas, entertained the crowd as the emcee for the duck races and duck squat. Deb Nittler was the winner of the winning duck race and the $1,000 cash prize. Chris Robe was the winner of the duck squat and was awarded $500. There were also raffle winners at the event, while Jan Hatfield provided musical entertainment. Great Western Dining catered the dinner. There were 533 ducks sold for the duck race. 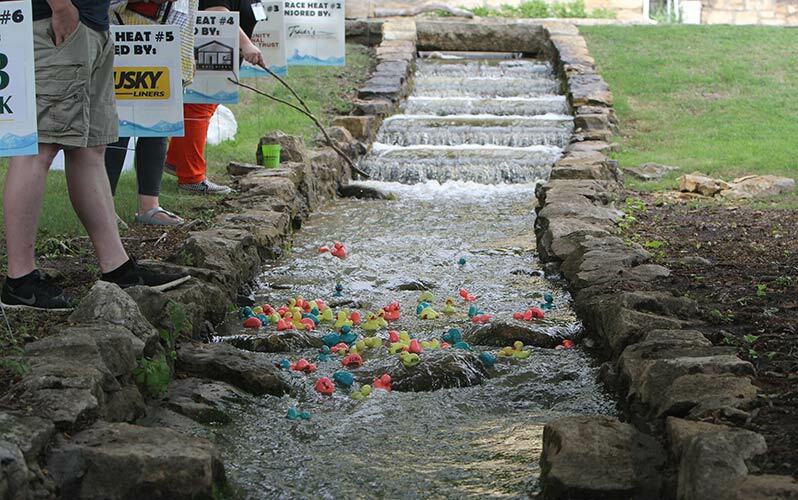 *Duck race $75 heat winners — Deb Nittler, Donna Avery, Munson Appraisal, Rama Peroo, Charlotte Schmidt, Arty Hicks. *Winner of the Consolation race and $100 – Kendra Redford. *Relax & Rejuvv’ Rejuvv’ Spa Package sponsored by Tracie Gordon and Kansas Star Casino Hotel – Kelly Ford. *Wine & Wings sponsored by B Four Flying, Patterson Park Inn and a Friend of the Foundation – Brad Hopkins. *Music & More sponsored by Cowley College Marketing Department, Kansas Star Casino Hotel, and Dr. Dennis C. Rittle – Mandi Hernandez. *Outdoor Fun sponsored by WB Meats, Rubbermaid, a Friend of the Foundation, and the Cowley College Foundation – Darren Mora. *Tree valued at $250 from Gottlob Landscaping – Jody Arnett. *Duck Dash Rubbermaid Cooler with various gifts inside donated by Rubbermaid, A Break from Reality, RooJax, McDonald’s Used Books, City of Arkansas City, and Rob Carroll Sandblasting & Painting – Shae Koenke. *$250 cash donated by the Cowley College Foundation – Patti Ostemann.